The choir meet every Monday after school from 3.15pm to 4.15pm. The choir is fully inclusive and anyone from KS2 is welcome to join. The choir have many opportunities to sing within the community. The School Choir were given the opportunity to sing at St Botolphs afternoon tea club. The Choir sang a variety of songs and the audience were invited to take part with the singing of the songs. The choir sang beautifully and were so well behaved. The children were then invited to stay after the performance and have drinks and cakes with the members of the club. On Tuesday 5th February the school choir took part in the Young Voices concert held at The O2. The children sang with 8000 other children from the south east area. The choir sang many songs and well known medlies. The concert finished with a spectacular selection of songs from ‘The Greatest Showman’. On Friday 29th January the choir attended the Young Voices concert which was held at the 02 in London. The Choir attended the concert together with 7,000 other children in the South East area. The Choir were amazing. Their singing was excellent and their behaviour was outstanding. We left the school at 12.30pm and travelled to the O2 by coach. The children sang various medleys including a Madness medley, Gospel medley, a Transport of delight medley and a brilliant pop medley. It was a great evening, giving the Choir an opportunity to perform with professional musicians. We hope to attend the next concert in 2018! On the 30th June 2016 the choir attended the Gravesham Choral Festival, held at the Woodville Halls. They sang together with 200 children from Gravesham schools. Christmas has been a very busy time for the Choir at Lawn. 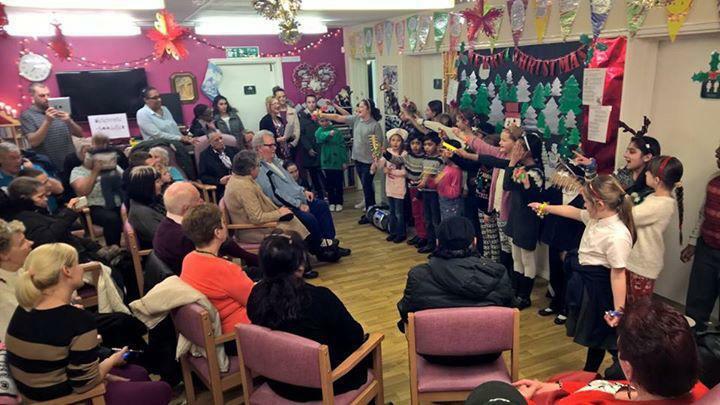 On Thursday 10th December, 18 children together with their parents braved the weather and sang at Garden Lodge, Deneholm Road, for the Alzheimers and Dementia Society. The Christmas lights were switched on at 7pm while the children were singing Away in a Manger and the evening concluded with a fantastic performance of Feed the world, which had been organised by the children. On Friday 11th December the choir sang at the Christmas Bazaar, to their parents and visitors. The choir were amazing at the cafechurch, Costa Coffee at Bluewater. A special Christmas church service took place and children were given the opportunity to take part in a 'Making a wreath Competition' The choir concluded the evening by singing, 'Little Donkey', 'Mary had a baby' and 'Away in a Manger'. The choir Sang at the Garden Lodge for the Alzeihmers and Dementia Society Christmas Party. The choir sang for the residents of Kesson House in Northfleet. The choir were amazing at all these events, I am so proud of them all. Bag Packing at Asda Northfleet. On Saturday 12th September the choir were given the opportunity to pack bags at Asda's checkouts, to raise funds for their trip to the O2 in January. The children spent four hours packing bags and raised a fantastic £600 for their trip. The school choir were invited to sing for the opening of the new Asda store. The children sang beautifully. Asda donated a £500.00 cheque to buy the children's T-shirts for the O2 concert in January. The choir also collected £84.00 from customers who visited the store. The school choir at the Choral Festival on 1st July 2015 at the Woodville Halls.